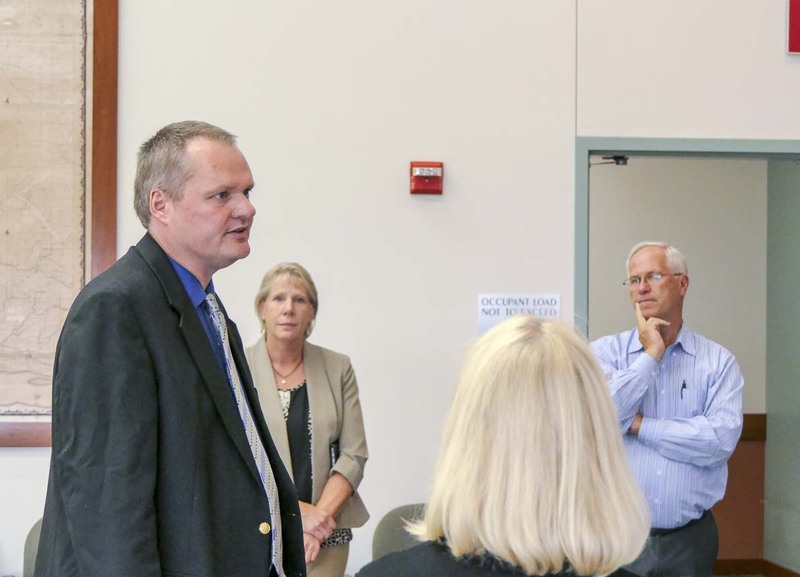 CLARK COUNTY — Employees and elected officials of Clark County gathered Monday afternoon to share a few thoughts with their new county manager. Shawn Henessee, his wife, and their three dogs, arrived at their new-yet-old Rose Village neighborhood home last Friday. “Managed to pick two of the hottest days of the year to unload the U-Haul,” Henessee laughs. The heat that greeted the county’s new top executive had a bit of irony given that, during a meet-and-greet with the three finalists last May, Henessee joked that part of the reason he wanted to come to the Northwest was to escape the oppressive heat in Pleasant Hill, Missouri, where he was serving as city administrator. Standing well over six feet tall, with short graying hair, Henessee cuts an imposing, if unassuming figure. His selection came after a previous search for a new county manager came up short in February. In all, it has been over 14 months since former county manager Mark McCauley was terminated by the council. 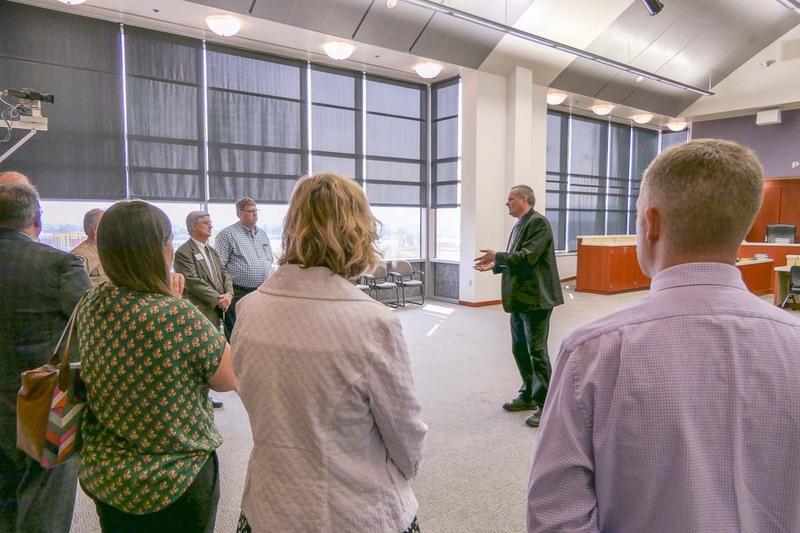 In May, three new finalists answered questions posed by interim county manager Jim Rumpeltes, who said they expected selecting the winner would take a couple of weeks. Just two days later the council announced Henessee was their unanimous choice. While the town of Pleasant Hill is much smaller than Clark County, Henessee says he has a broad range of experience with other forms of governments, as well as many counties larger than Clark County. He served as county administrator for Marinette County, Wisconsin, from 2015 — 2017. Henessee has a Master’s Degree in political science, but says he learned early on that he never wanted to run for office. He also has a law background, particularly in land use, but says his experience working at a prestigious law firm taught him he didn’t want to be stuck in a “gilded cage”. Despite that, Henessee has been approved to practice law in Washington State, proving before he even got the county job that he was serious about moving to and remaining in the Northwest. As for what he’s getting himself into, Henessee is well aware that the 2014 Home Rule Charter that changed the way Clark County government works is still very much a work in process. As for what that will ultimately look like, and how the balance of power will play out between the manager and the council, Boldt is optimistic. Henessee’s first official day was Monday, and he’s still getting his feet wet. “I already somewhat about the issues, but there’s always more that you learn about the issues. Getting more information about that,” he says. That means Henessee will quickly have to wrestle with weighty issues, such as what to do with the overcrowded, outdated county jail, how to address the I-5 bridge situation, staffing issues, building permits and the long-overdue move to modernize them, and managing the ongoing growth of Clark County. Henessee is starting about a week later than anticipated when the council approved his contract on June 12. His starting salary will be $170,000 per year.